Lighting is one of the most important parts of any bathroom renovation. Although your bathroom is one of the smallest spaces in your house, it serves a lot of purposes. Not only do you use your bathroom regularly for basic hygiene, you use it to get ready for a date, to relax after a long day of work, and to indulge in spa treatments without leaving your home. However, you can also use your bathroom lighting as a way to give the room a specific look, and express your own personality a little bit. Here are some creative ideas for bathroom lighting to inspire you as you plan your own renovations. 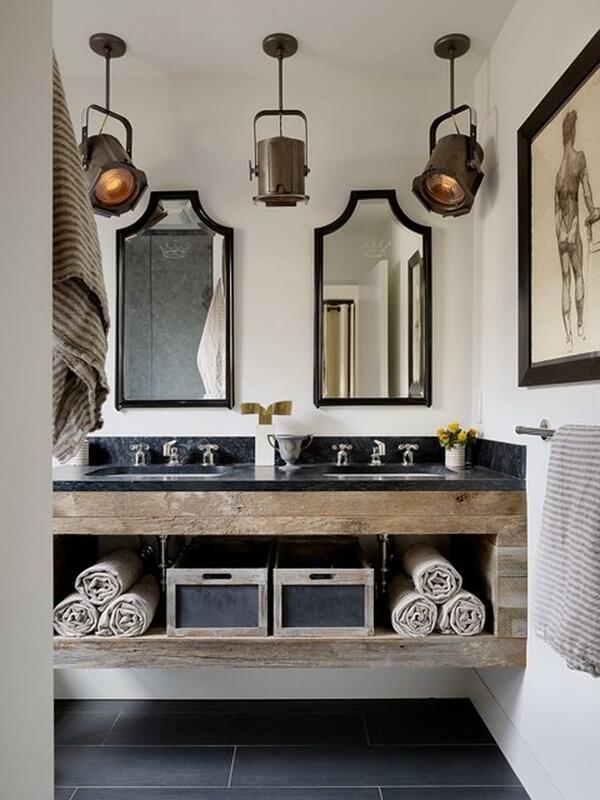 While not ideal for practical bathroom purposes, like applying makeup, these dark and moody fixtures lend themselves to the idea of relaxation and calm. With the dark, textured walls and counters and a backlight to brighten the area by the sink, these pendant lights are a perfect highlight for the room. The yellow color of the lighting here might not work well for everyday use, but adds some much-needed warmth to this cool-looking bathroom. 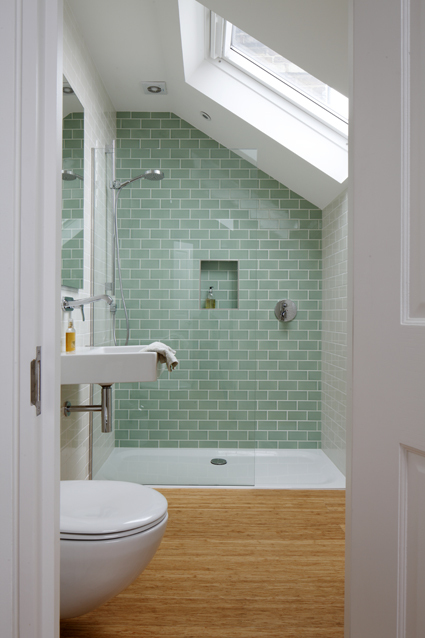 Bringing in natural light is a great way to brighten up your bathroom space and help open up a very small room. This skylight is a perfect complement to the warm floors and cool tiles in this room, bathing everything in the soft white glow of the sun. It’s also great for tasks like applying makeup, where the natural light gives you a more accurate reflection in the mirror. Make a bold statement with a dramatic hanging chandelier above your bathtub. 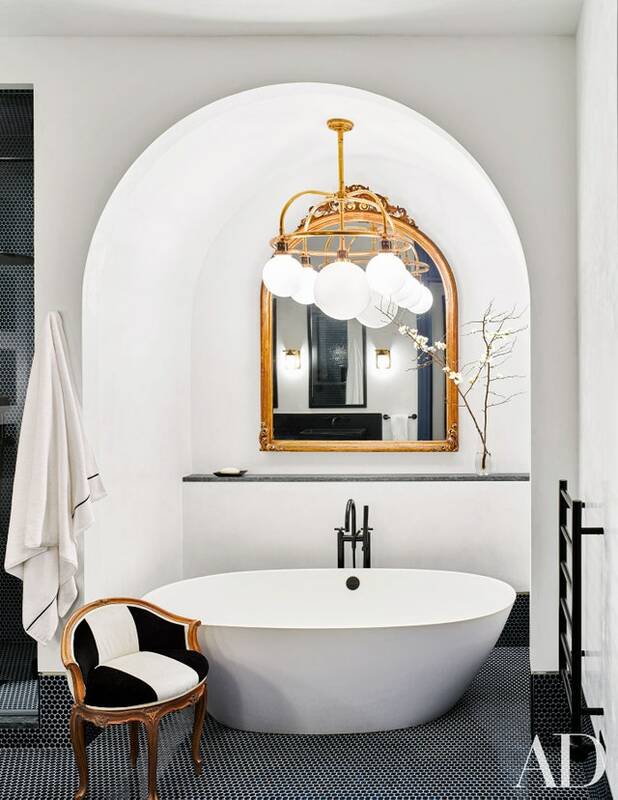 This fixture both blends in and stands out, taking advantage of the beautiful archway that accentuates this bathroom nook. Whatever your style, you can never go wrong with a statement like this. 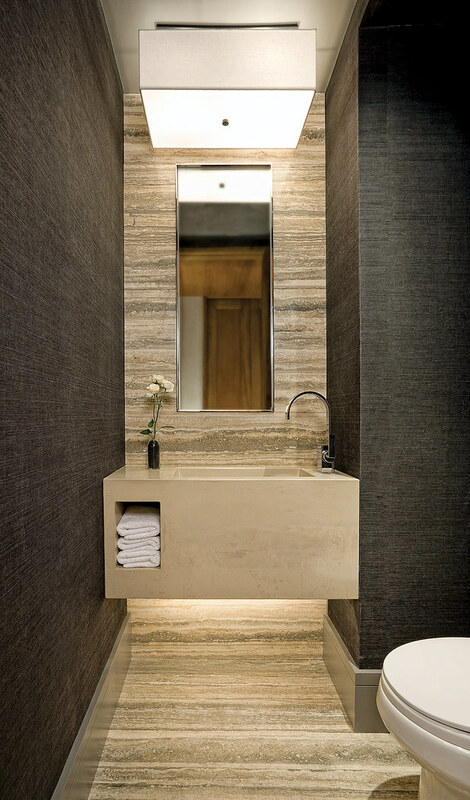 With dark walls and intense backlighting behind the mirror, this bathroom gives off a decidedly masculine vibe. The simplicity of this style of lighting and the lack of visible fixture makes this a perfect choice for anyone looking to decorate in a more minimalist style. It’s also great for highlighting your face in front of the mirror, which comes in handy when you’re trying to get a nice, close shave. 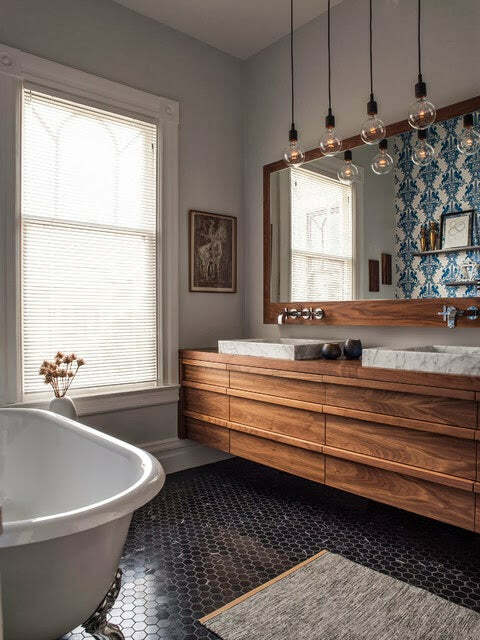 These pendant lights with unique Edison bulbs are more than just functional – they bring a bit of a graphic element to a bathroom full of textures and colors. The warm glow of the bulbs is ideal with the warm wood of the console, adding a feeling of coziness to this beautiful room. The black fixtures gives a great feeling of heaviness to these small fixtures. 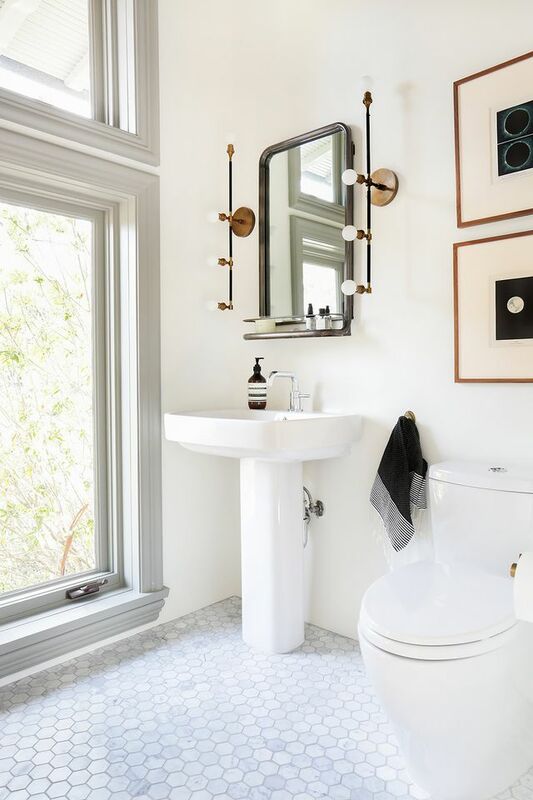 With a modern console, smooth tile floors, and white walls, this room could risk looking boring – but the unique shape of the mirrors and fantastic vintage spotlight fixtures bring a very original style to the bathroom. Don’t be afraid to get experimental with your bathroom lighting, this little room is the perfect spot to do something a little different. You can also spend a little more on fixtures here, without investing a ton of money in styling a large room. This boxy fixture perfectly mimics the style of the console underneath it, tying the room together and creating an interesting visual effect – while still providing great light for anyone using this bathroom. The clean lines and diffused light also lend a somewhat masculine feel to the room. These unique lights are more than functional – they almost provide an aspect of sculptural art to this stark, clinical bathroom. The vintage style of the mirror and the fixture work well together, and the copper-y highlights bring a bit of much-needed color to the space. But these lights don’t just look great. The positioning along the mirror makes them perfect for shaving, applying makeup, or just giving yourself a quick once-over before leaving the house. These ideas offer some great jumping off points to inspire a unique bathroom design – complete with creative lighting to set it off perfectly. Remember that because your bathroom serves so many purposes, you might want to consider layering your bathroom lighting to make sure you have bright light for everyday tasks and some mood lighting options for when you need your bathroom to be a relaxing, private escape.